I'm not sure if Cookie Monster would like this, but I think all the ladies trying not to turn into Winter Walruses probably will! 1. Break the cauliflower into bite sized pieces and scatter into 2 large baking trays. To get the best evenly roasted, most golden, crispy cauliflower, make sure you don't overcrowd the trays (i.e. leave some breathing space between the pieces). Drizzle 1 tbsp oil over each tray, then season with salt and pepper. Roast in a 180 deg oven for 30-40 mins or until cauliflower is nicely browned. Give the trays a shake every 10-15 mins. 2. Roughly chop the parsley and shallots and finely slice the celery. You want the celery to be a little bit delicate so it's not overpowering. Because the cauliflower is relatively soft, you don't want to be chewing on big chunks of celery. 3. Dry roast the spices with the nuts and seeds in a pan on a medium heat for about five minutes mins, or until fragrant and the nuts are slightly golden. Continuously shake the pan so you don't set your fire alarm off (not good when you need to evacuate your building in your pyjamas). 4. 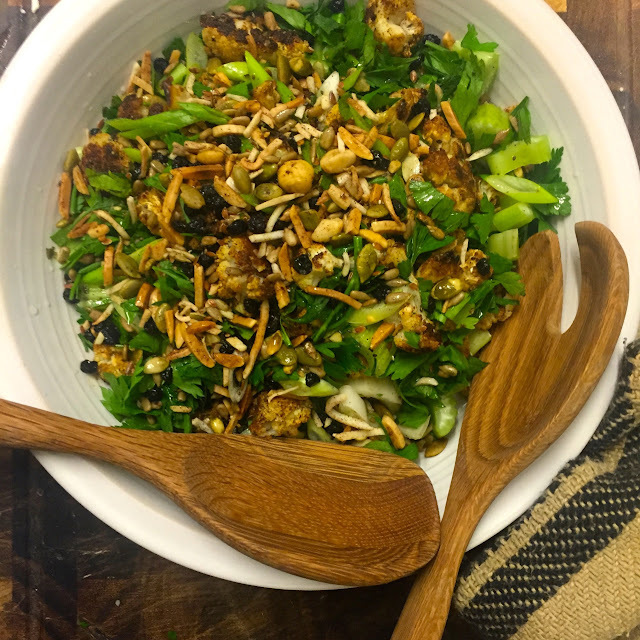 Mix the cauliflower, greens, nuts, spices and dried blueberries together in a bowl and squeeze the lemon juice over and the remaining tbls of oil and season with a little more salt and pepper. Chomp down.